The tripod market is a very crowded one and, while there are now more good models to choose from than ever, there are many more not-so-good models to sort out of the selection process. Buying a low quality tripod typically means buying a second tripod – if the first tripod does not turn the photographer off to tripod use altogether. Though increasingly difficult, with imaging sensor pixel densities increasing, selecting a good quality tripod is more important than it ever was. 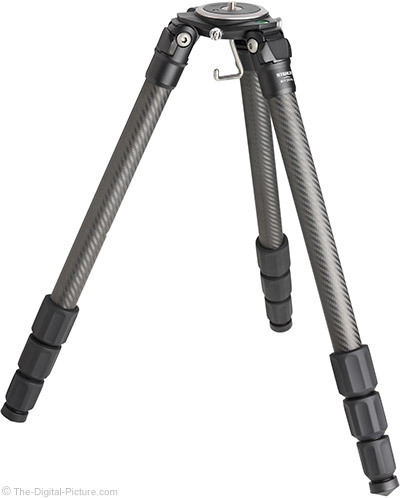 Gitzo 3-Series carbon fiber tripods have been my standard choice for many years. They are the best of the best. Unfortunately, they are also priced as such. Many cannot pay the premium for the Gitzo tripod, but they still want and need a high quality model. I'm always searching for good value gear to be able to recommend to such tripod shoppers. Induro's name has been coming up more and more frequently (including by some well-known photographers) and, with a photo trip approaching, I felt the urge to give their Induro GIT304L Grand Series 3 Stealth Carbon Fiber Tripod a try. While Induro has a wide range of models available, the GIT304L is the model that most similarly equates to the Gitzo model I use and recommend most. It is the right size and strength for most applications while not being too large or heavy. I often have at least had my hands on a tripod before I commit myself to a full test, but ... I didn't have that opportunity with the GIT304L. So, before I fully commited to taking the GIT304L as my primary tripod on this trip, I needed to give it a workout. Or, perhaps ... give me a workout. Want to know how strong a tripod's leg locks are? Fully extend the legs and tighten the locks. While keeping the legs together (not spread), pull down with all of your weight. Note that exceeding the weight limit of a tripod could break it (I do so at my own risk), but strong leg locks will not retract under the pressure of my weight. The Induro GIT304L holds my weight (roughly 170 lbs / 77kg) solidly, even when I bounce my weight. To further test the strength of a tripod, I fully extend the tripod legs and spread them to the first stop and then hang from them. Again, exceeding the weight limit risks breaking the tripod (and there is a chance that I will hit the ground fast if that happens). The Induro has no problem with my weight, and doing pull-ups seems to not phase it. I'm never going to use that much weight on this tripod in the field, but knowing that the strength is there makes me more confident in mounting expensive camera gear to it and comfortable recommending that you do the same. Supporting my weight may seem like an excessive requirement, but I sometimes rely on my tripod to hold me personally. While not all photographers get themselves into the situations I get into, those of us who do need to rely on the tripod legs to support ourselves while navigating steep trails, large rocks and other difficult terrain. 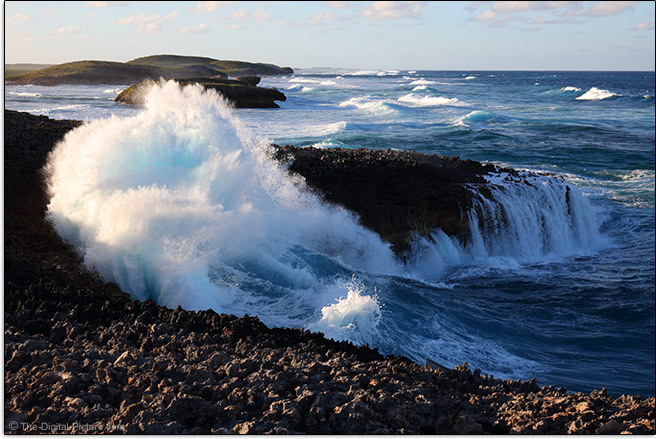 On this trip, I ended up shooting in high winds a good amount during my trip meant that I was applying a lot of weight to reduce wind-induced vibrations. Another important consideration for tripod selection is the material the tripod legs are constructed of. Most typically, today's tripod legs are made of aluminum or carbon fiber. Carbon fiber models are typically lighter than equally-weight-rated aluminum models and another carbon fiber advantage is its ability to better dampen vibrations than aluminum. If using the tripod in cold temperatures, you will much-appreciate holding a carbon fiber tripod compared to an aluminum model. Carbon fiber does not transfer heat as easily as aluminum, making carbon fiber much more comfortable to use in cold temperatures. Aluminum dents and bends while carbon fiber breaks. Neither is good and the latter is less likely, but dented and/or bent may remain usable. Also for consideration is that aluminum is susceptible to corrosion - especially if used in/around salt water. I used the Induro GIT304L in heavy salt water spray during my 7 days of shooting with a simple damp cloth wipe-down making it appear as new with no concern for leg corrosion. One of aluminum's biggest advantages is lower cost. Carbon fiber is my strong preference – it is all I use in the field. Load capacity and weight of the tripod is generally a compromise. To hold more weight, a heavier tripod is needed. A rule of thumb used by many photographers is to select a tripod with a load capacity of at least 2x the weight of the gear intended to be mounted on it. While the manufacturer load capacity rating may be accurate, a stronger, more-rigid tripod will reduce the amount of vibration experienced (such as in the wind). And eliminating vibration is a key reason for using the tripod in the first place. Thus, many go for at least a 2x load capacity rating. 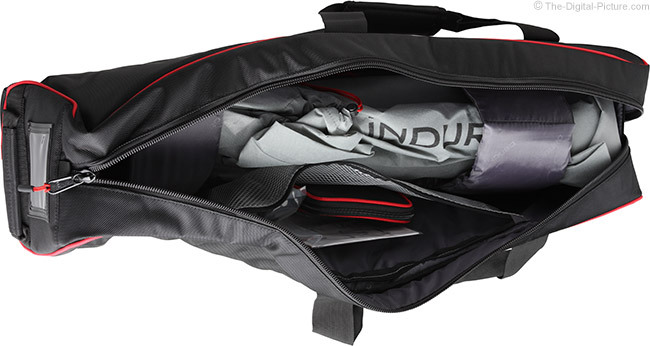 The Induro GIT304L has a load capacity of 55.1 lb (25kg). Even using the 2x rule, this tripod can be used for 25 lb (13kg) loads – weights considerably heavier than most of us care to use on a tripod. Though available as an option, the Induro GIT304L comes with no extending center column. Center columns provide for fast height adjustments, but they significantly increase vibrations when used in the raised position. The higher the column is raised, the more vibrations will be experienced. The difference is obvious; my tripods seldom have center columns in place. Another tripod selection consideration is the number of leg sections. I generally go with 4-section legs (the "4" in the "GIT304L") for my primary tripod. This gives me a more-compact retracted size that is especially appreciated when traveling. Because there is one additional leg lock on each leg, 4-section tripods may cost a bit more and will likely take slightly longer to setup at full extension. With an additional leg lock and the lower leg section having a smaller diameter, a 4-section tripod with the lower leg section extended has the potential to be slightly less stable than a 3-section equivalent, though neither issue seems to be as problematic as years ago. Tripod leg lock choices are typically twist-lock or flip-lock styles. This choice is generally a personal preference, but I prefer the twist lock style as found on Induro's tripods for setup speed and compact size. An important-to-me tripod feature is independent leg spread. For general purpose use, you want your DSLR tripod legs to open at various angles to accommodate whatever terrain you may encounter. Starting at the bottom, we find three sets of threaded feet included in the box. The already-installed standard rubber feet are ideally sized – large enough to add some protection to the bottom of the legs while not large enough to become challenging to place in rocks and other precarious locations. Spikes and ovoid (egg-shaped) pivoting rubber feet, for extra grip, are provided. The carbon fiber leg sections are smooth with an attractive, high quality look (the carbon fiber stands out) and feel. Very important to me is that the leg sections do not rotate, allowing individual leg locks to be tightened while others remain loose. The Induro uses twist-style leg locks. While 1/4 turn is all that is needed to tighten or loosen each lock, the amount of required rotation is noticeably more than the current Gitzo leg locks. 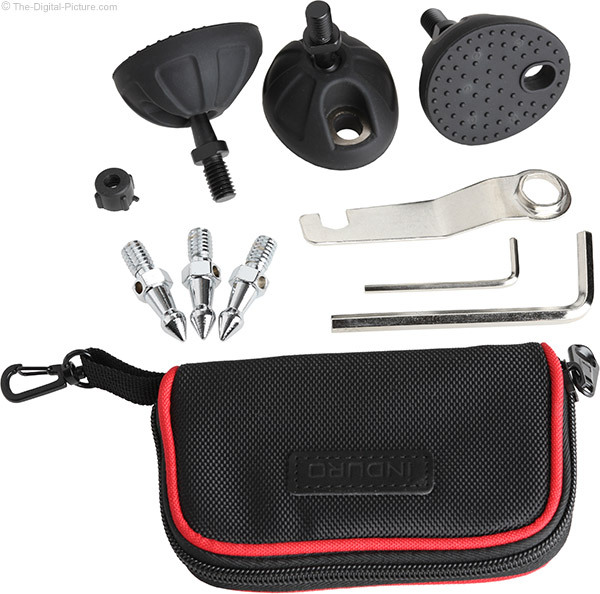 The locks have a comfortable, easy-to-grip, substantial-sized rubber surface. While these are very nice, the length of the locks is such that my medium-sized hands can *just* grasp all three at once for quick simultaneous locking or unlocking. Shorter locks would make this task easier, especially for smaller hands. The diameter of the locks seems nice, but in use, narrower locks would require less hand rotation to turn them enough to fully lock or unlock. The leg locks are a notable differentiator between the Gitzo and Induro carbon fiber tripods. The Induro GIT304L Grand Series Stealth Carbon Fiber Tripod's magnesium alloy chassis/spider is very nicely designed and is quite strong. Pull the aluminum angle locks outward (or push them out from the back) to allow the legs to spread wider than the first stop. Decide which of the three leg angle notches you want to use by pulling the angle lock out to the right distance for the desired stop. Once you familiarize with the tripod, you can set the angle lock and the legs will open to a specific spread angle. The widest setting is used to reach down to the CT02491's 5.1" (13 cm) minimum height (measured with legs fully retracted and standard feet installed). A spirit level is provided on the chassis. Think the legs open too easily or are too tight? Loosen or tighten the axle bolts with the included wrench. I tightened the default setting slightly to prevent the legs from opening or closing while carrying the tripod with a camera mounted (note that you will not likely find ball head manufacturers recommending this). The removable top plate is nylon/plastic-covered aluminum with a 3/8"-16 threaded adapter for a tripod head on the top and a substantially-sized hook on the bottom. A spring-loaded pin prevents the top plate from inadvertently releasing unintentionally. A substantial set screws is provided to lock a head into place. While using this screw is a good idea, I change heads between tripods with some frequency and therefore didn't use it – and didn't have a problem with the Gitzo GH3382QD Series 3 Center Ball Head I primarily used for a week coming loose. The top plate can be field replaced (racheting screw built in) with a geared center column, a leveling head or a video half bowl. 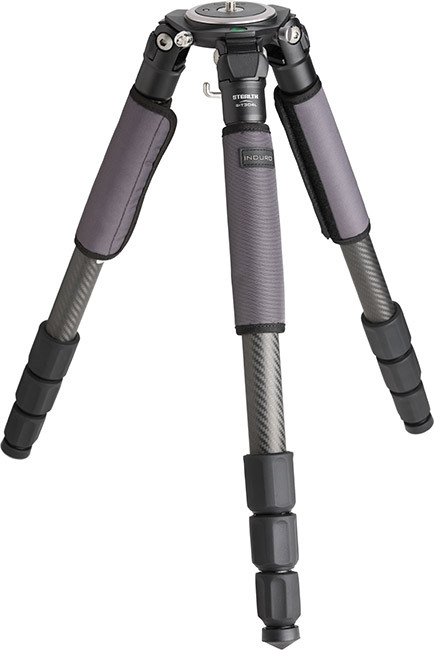 Overall, this is a light weight, very high quality and very solid tripod with great build quality and great looks. The tripod holds me while doing pull-ups under it and I am comfortable with the largest DSLR camera and lens combinations available resting on top of the Induro GIT304L from a strength position. Vibration control is more of a hidden feature of tripods. As far as vibrations go, I am comfortable using lenses up to 400mm. You can go larger/longer, but care will need to be taken to keep vibrations dampened, especially if there is some wind. I was frequently using the Canon EF 100-400mm f/4.5-5.6L IS II Lens on the GIT304L with no issues most of the time. With the standard feet installed and the legs fully extended and opened fully to the first angle lock, I measured the Induro GIT304L's top plate height at 56.8" (144cm), a bit shy of the 59.1" (150.0cm) spec and identical to the Gitzo GT3542LS. This tripod has adequate height for me (6'/1.8m) to comfortably shoot from most positions. Remember that your tripod ball head and camera/lens tripod-mount-to-viewfinder heights add significantly to the tripod's height during use. Completing the included accessories are three Velcro-attached padded nylon hand warmers with grippy dots on the inside helping to hold them in place. And, a few wrenches are provided for any adjustments and changes needed. Finding just the right tripod case seems always a challenge as the limited number of available cases never seem to be the right size, especially for a mounted ball head. The Induro GIT304L comes with its own case right in the box. This is not just a dust bag (it comes with a far-oversized dust bag also), but a seriously-well-padded heavy-grade nylon case with a full length (plus a side) zipper, strong handles and backpack straps. The Induro TCC2081 case has room for a 7.5" (19cm) high tripod head. I would have made the 7x7x31" (18x18x79cm) case one inch smaller in diameter (to 6x6" / 15cm) (and perhaps shaved off some length) to make it more compact, but especially with the wide, thick padded straps holding the tripod in place, this is one of the most protective tripod cases I've seen. Especially impressive for an included case. With a 5 year warranty that is extendable to 10 years via product registration, Induro believes their product is built to last. As I write this review, the Gitzo GT3542LS Systematic 6X Carbon Fiber Tripod is my primary tripod. Especially because you rely on me to accurately evaluate camera gear, I make sure that my camera platform is the most solid I can find (while remaining sized for field use). Nothing I've used has come close to surpassing this Gitzo line. Nothing I've used has cost nearly as much, but you do get what you pay for in this case. The biggest differentiator from an image quality perspective is the difference in vibration resistance. Stand both tripods up and tap the middle leg section. The Induro's vibration last noticeably longer. The same can be observed with a lens mounted. Add some wind in the field for the same results. 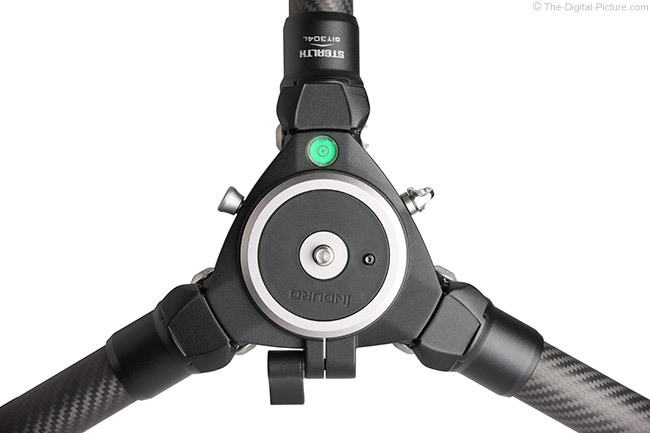 The Gitzo's larger chassis/spider is partly responsible for the increased rigidity. The another big difference is in the leg locks. The Gitzo locks are notably faster to adjust and that difference was readily apparent when I was trying to capture a number of different compositions at the ideal time during sunset. A faster-to-setup tripod will get more images in the same amount of time. Time is money. I'm sure that you've heard that one before, but if you've spent money to travel to a location, increasing your take-home within your allotted time has real benefit. This concept has even more merit for business uses, where you are being paid for what you produce. Produce more, get paid more. The difference is noticeable: while on a recent trip, a seasoned bear guide commented on how fast I could setup and tear down my Gitzo tripod. The Gitzo's leg locks are also slightly more rigid laterally. This slight difference can be felt by pressing laterally on the fully extended legs. Are the Gitzo's advantages worth the significant extra cost is the question you need to ask yourself. Not everyone can afford the equivalent Gitzo model. Not everyone needs additional vibration dampening and setup/teardown speed is not important to everyone. For those people, the Induro GIT304L Grand Series Stealth Carbon Fiber Tripod offers significantly high quality and functionality for a value price. It is a very good deal.